Discussions Magazine Music Blog: An EXCLUSIVE Interview with SHOES! 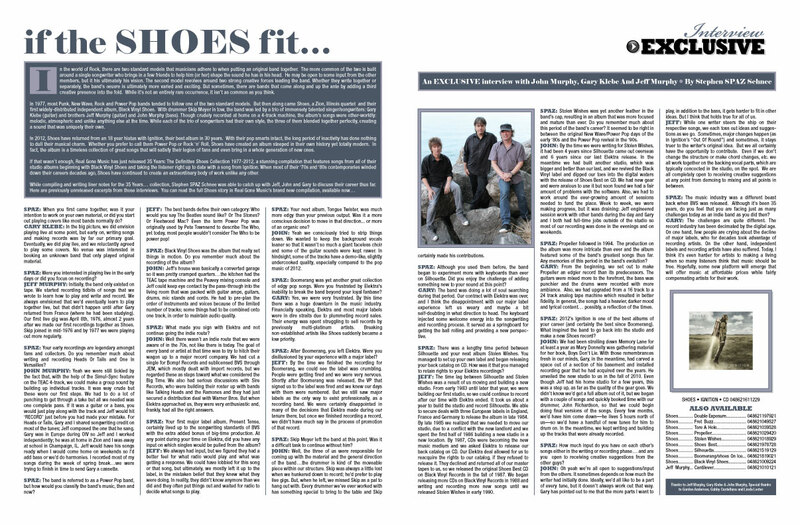 An EXCLUSIVE Interview with SHOES! In the world of Rock, there are two standard models that musicians adhere to when putting an original band together. The more common of the two is built around a single songwriter who brings in a few friends to help him (or her) shape the sound he has in his head. He may be open to some input from the other members, but it his ultimately his vision. The second model revolves around two strong creative forces leading the band. Whether they write together or separately, the band’s oeuvre is ultimately more varied and exciting. But sometimes, there are bands that come along and up the ante by adding a third creative presence into the fold. While it’s not an entirely rare occurrence, it isn’t as common as you think. In 1977, most Punk, New Wave, Rock and Power Pop bands tended to follow one of the two standard models. But then along came Shoes, a Zion, Illinois quartet and their first widely-distributed independent album, Black Vinyl Shoes. With drummer Skip Meyer in tow, the band was led by a trio of immensely talented singer/songwriters: Gary Klebe (guitar) and brothers Jeff Murphy (guitar) and John Murphy (bass). Though crudely recorded at home on a 4-track machine, the album’s songs were other-worldly: melodic, atmospheric and unlike anything else at the time. While each of the trio of songwriters had their own style, the three of them blended together perfectly, creating a sound that was uniquely their own. 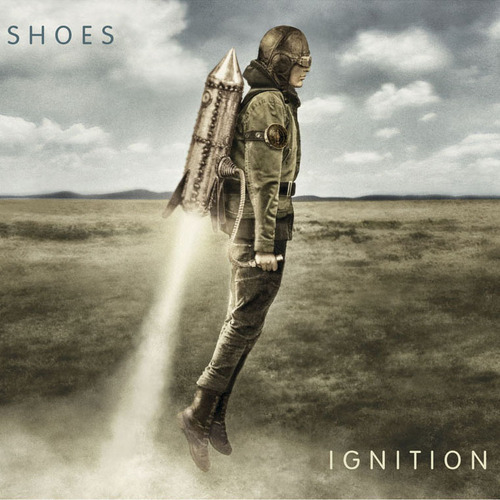 In 2012, Shoes have returned from an 18 year hiatus with Ignition, their best album in 30 years. With their pop smarts intact, the long period of inactivity has done nothing to dull their musical charm. Whether you prefer to call them Power Pop or Rock ‘n’ Roll, Shoes have created an album steeped in their own history yet totally modern. In fact, the album is a timeless collection of great songs that will satisfy their legion of fans and even bring in a whole generation of new ones. 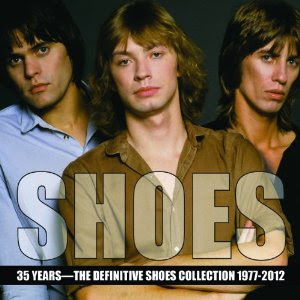 If that wasn’t enough, Real Gone Music has just released 35 Years: The Definitive Shoes Collection 1977-2012, a stunning compilation that features songs from all of their studio albums beginning with Black Vinyl Shoes and taking the listener right up to date with a song from Ignition. When most of their ‘70s and ‘80s contemporaries winded down their careers decades ago, Shoes have continued to create an extraordinary body of work unlike any other. SPAZ: When you first came together, was it your intention to work on your own material, or did you start out playing covers like most bands normally do? GARY KLEBE: In the big picture, we did envision playing live at some point, but early on, writing songs and making records was by far our primary goal. Eventually, we did play live, and we reluctantly agreed to play some covers. No venue was interested in booking an unknown band that only played original material. SPAZ: Were you interested in playing live in the early days or did you focus on recording? JEFF MURPHY: Initially, the band only existed on tape. We started recording tidbits of songs that we wrote to learn how to play and write and record. We always envisioned that we'd eventually learn to play together live, but that didn't happen until after Gary returned from France (where he had been studying). Our first live gig was April 8th, 1976, almost 2 years after we made our first recordings together as Shoes. Skip joined in mid-1976 and by 1977 we were playing out more regularly. SPAZ: Your early recordings are legendary amongst fans and collectors. Do you remember much about writing and recording Heads Or Tails and One In Versailles? JOHN MURPHY: Yeah we were still tickled by the fact that, with the help of the Simul-Sync feature on the TEAC 4-track, we could make a group sound by building up individual tracks. It was way crude but these were our first steps. We had to do a lot of punching to get through a take but all we needed was one complete pass. If it was a guitar or a bass, you would just play along with the track and Jeff would hit ‘RECORD’ just before you had made your mistake. For Heads or Tails, Gary and I shared songwriting credit on most of the tunes; Jeff composed the one that he sang. Gary was in Europe during OIV so Jeff and I worked independently; he was at home in Zion and I was away at school in Champaign, IL. Jeff would have his songs ready when I would come home on weekends so I’d add bass or we’d do harmonies. I recorded most of my songs during the week of spring break…we were trying to finish in time to send Gary a cassette. SPAZ: The band is referred to as a Power Pop band, but how would you classify the band’s music, then and now? JEFF: The best bands define their own category: Who would you say The Beatles sound like? Or The Stones? Or Fleetwood Mac? Even the term Power Pop was originally used by Pete Townsend to describe The Who, yet today, most people wouldn't consider The Who to be power pop! SPAZ: Black Vinyl Shoes was the album that really set things in motion. Do you remember much about the recording of the album? JOHN: Jeff’s house was basically a converted garage so it was pretty cramped quarters…the kitchen had the TEAC tape machine and the Peavey mixing console and Jeff could keep eye contact by the pass-through into the living room that was packed with guitar amps, guitars, drums, mic stands and cords. He had to pre-plan the order of instruments and voices because of the limited number of tracks; some things had to be combined onto one track, in order to maintain audio quality. SPAZ: What made you sign with Elektra and not continue going the indie route? JOHN: Well there wasn’t an indie route that we were aware of in the 70s, not like there is today. The goal of every band or artist at that time was to try to hitch their wagon up to a major record company. We had cut a single for Bomp! Records and sublicensed BVS through JEM, which mostly dealt with import records, but we regarded these as steps toward what we considered the Big Time. We also had serious discussions with Sire Records, who were building their roster up with bands like Talking Heads and the Ramones and they had just secured a distribution deal with Warner Bros. But when Elektra approached us, they were very enthusiastic and, frankly, had all the right answers. SPAZ: Your first major label album, Present Tense, certainly lived up to the songwriting standards of BVS with the extra added bonus of big-time production. At any point during your time on Elektra, did you have any input on which singles would be pulled from the album? JEFF: We always had input, but we figured they had a better feel for what radio would play and what was getting a response. We could have lobbied for this song or that song, but ultimately, we mostly left it up to the label, in the mistaken belief that they knew what they were doing. In reality, they didn't know anymore than we did and they often put things out and waited for radio to decide what songs to play. SPAZ: Your next album, Tongue Twister, was much more edgy than your previous output. Was it a more conscious decision to move in that direction... or more of an organic one? JOHN: Yeah we consciously tried to strip things down. We wanted to keep the background vocals leaner so that it wasn’t so much a giant faceless choir and some of the guitar sounds were kept rawer. In hindsight, some of the tracks have a demo-like, slightly undercooked quality, especially compared to the pop music of 2012. SPAZ: Boomerang was yet another great collection of edgy pop songs. Were you frustrated by Elektra's inability to break the band beyond your loyal fanbase? GARY: Yes, we were very frustrated. By this time there was a huge downturn in the music industry. Financially speaking, Elektra and most major labels were in dire straits due to plummeting record sales. Their energy was spent struggling to sell records by previously multi-platinum artists. Breaking non-established artists like Shoes suddenly became a low priority. SPAZ: After Boomerang, you left Elektra. Were you disillusioned by your experience with a major label? JEFF: By the time we finished the recording for Boomerang, we could see the label was crumbling. People were getting fired and we were very nervous. Shortly after Boomerang was released, the VP that signed us to the label was fired and we knew our days with them were numbered. But we still saw major labels as the only way to exist professionally, as a recording band. We were certainly disappointed in many of the decisions that Elektra made during our tenure there, but once we finished recording a record, we didn't have much say in the process of promotion of that record. SPAZ: Skip Meyer left the band at this point. Was it a difficult task to continue without him? JOHN: Well, the three of us were responsible for coming up with the material and the general direction of the band…the drummer is kind of the moveable piece within our structure. Skip was always a little lost when we hunkered down to record; he’d prefer to play live gigs. But, when he left, we missed Skip as a pal to hang out with. Every drummer we’ve ever worked with has something special to bring to the table and Skip certainly made his contributions. SPAZ: Although you used them before, the band began to experiment more with keyboards than ever on Silhouette. Did you enjoy the challenge of adding something new to your sound at this point? GARY: The band was doing a lot of soul searching during that period. Our contract with Elektra was over, and I think the disappointment with our major label experience left us weary and maybe a bit self-doubting in what direction to head. The keyboard injected some welcome energy into the songwriting and recording process. It served as a springboard for getting the ball rolling and providing a new perspective. SPAZ: There was a lengthy time period between Silhouette and your next album Stolen Wishes. You managed to set up your own label and began releasing your back catalog on CD. How was it that you managed to retain rights to your Elektra recordings? JEFF: The time lag between Silhouette and Stolen Wishes was a result of us moving and building a new studio. From early 1983 until later that year, we were building our first studio, so we could continue to record after our time with Elektra ended. It took us about a year to build the studio and record Silhouette. We able to secure deals with three European labels in England, France and Germany to release the album in late 1984. By late 1985 we realized that we needed to move our studio, due to a conflict with the new landlord and we spent the first half of 1986 building a new studio in a new location. By 1987, CDs were becoming the new music medium and we asked Elektra to release our back catalog on CD. Our Elektra deal allowed for us to reacquire the rights to our catalog, if they refused to release it. They declined and returned all of our master tapes to us, so we released the original Shoes Best CD on Black Vinyl Records in the fall of 1987. We began releasing more CDs on Black Vinyl Records in 1988 and writing and recording more new songs until we released Stolen Wishes in early 1990. SPAZ: Stolen Wishes was yet another feather in the band’s cap, resulting in an album that was more focused and mature than ever. Do you remember much about this period of the band’s career? It seemed to be right in between the original New Wave/Power Pop days of the early ‘80s and the Power Pop revival in the ‘90s. JOHN: By the time we were writing for Stolen Wishes, it had been 4 years since Silhouette came out overseas and 6 years since our last Elektra release. In the meantime we had built another studio, which was bigger and better than our last, and we revived the Black Vinyl label and dipped our toes into the digital waters with the release of Shoes Best on CD. We had new gear and were anxious to use it but soon found we had a fair amount of problems with the software. Also, we had to work around the ever-growing amount of sessions needed to fund the place. Week to week, we were making progress, but it was draining: Jeff engineered session work with other bands during the day and Gary and I both had full-time jobs outside of the studio so most of our recording was done in the evenings and on weekends. SPAZ: Propeller followed in 1994. The production on the album was more intricate than ever and the album featured some of the band’s greatest songs thus far. Any memories of this period in the band’s evolution? GARY: From the beginning, we set out to make Propeller an edgier record than its predecessors. The guitars were mixed more to the forefront, the bass was punchier and the drums were recorded with more ambiance. Also, we had upgraded from a 16 track to a 24 track analog tape machine which resulted in better fidelity. In general, the songs had a heavier, darker mood and lyrical content… possibly, a reflection of the times. SPAZ: 2012’s Ignition is one of the best albums of your career (and certainly the best since Boomerang). What inspired the band to go back into the studio and make a new Shoes record? JOHN: We had been strolling down Memory Lane for at least a year as Mary Donnelly was gathering material for her book, Boys Don’t Lie. With those remembrances fresh in our minds, Gary, in the meantime, had carved a space out of a section of his basement and installed recording gear that he had acquired over the years. He unveiled the new studio to us in the fall of 2010. Even though Jeff had his home studio for a few years, this was a step up, as far as the quality of the gear goes. We didn’t know we’d get a full album out of it, but we began with a couple of songs and quickly booked time with our drummer, John Richardson, so that we could begin doing final versions of the songs. Every few months, we’d have him come down—he lives 5 hours north of us—so we’d have a handful of new tunes for him to drum on. In the meantime, we kept writing and building up the tracks that were already recorded. SPAZ: How much input do you have on each other’s songs either in the writing or recording phase… and are you open to receiving creative suggestions from the other guys? JOHN: Oh yeah we’re all open to suggestions/input from the others. It sometimes depends on how much the writer had initially done. Ideally, we’d all like to be a part of every tune, but it doesn’t always work out that way. Gary has pointed out to me that the more parts I want to play, in addition to the bass, it gets harder to fit in other ideas. But I think that holds true for all of us. JEFF: While one writer steers the ship on their respective songs, we each toss out ideas and suggestions as we go. Sometimes, major changes happen (as in Ignition’s “Out Of Round”) and sometimes, it stays truer to the writer's original idea. But we all certainly have the opportunity to contribute. Even if we don't change the structure or make chord changes, etc. we all work together on the backing vocal parts, which are typically concocted in the studio, on the spot. We are all completely open to receiving creative suggestions at any point from demoing to mixing and all points in between. SPAZ: The music industry was a different beast back when BVS was released. Although it’s been 35 years, do you feel that you are facing just as many challenges today as an indie band as you did then? GARY: The challenges are quite different. The record industry has been decimated by the digital age. On one hand, few people are crying about the decline of major labels, who for decades took advantage of recording artists. On the other hand, independent labels and recording artists have also suffered. Today, I think it’s even harder for artists to making a living when so many listeners think that music should be free. Hopefully, some new platform will emerge that will offer music at affordable prices while fairly compensating artists for their work.